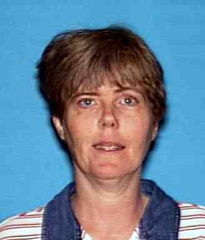 Los Angeles County Sheriff’s Department’s Norwalk Station detectives are asking for the public’s help in locating At Risk Missing Person Diane Louise Holst. She is a 61 year-old female White who was last seen at her home on the 14700 block of Pioneer Boulevard, Norwalk, on Monday, January 7, 2019, at approximately 6:00 p.m.
Diane is described as 5’07” tall, 160lbs, white short hair and green eyes. Her clothing description is unknown. Ms. Holst suffers from diabetes, bi-polar and schizophrenia. She has not been seen or heard from. 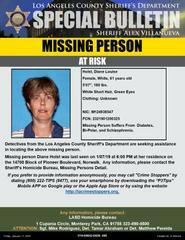 We are very concerned and asking for the public’s help in located her.